As per report undertaken by Human Rights Watch, United Kingdom should immediately suspend the transportation of Tamils to Sri Lanka and evaluate its immigration policies towards deportation. The transportation of Tamils from UK to Sri Lanka is due on 31st may 2012. Several allegations have come across the treatment of Sri Lanka’s Immigration Department on Tamil asylum seekers. These are actually subjected to arrest and torture by security forces upon their return to Sri Lanka. Similar cases were found by the report and disclosed that security forces of Sri Lanka have tortured migrants who came from different nations at detention centers. The report has flocked practical information from detained migrants. They claimed that Sri Lanka’s security forces have tortured and beaten them upon confinement. The cases happened in February 2012. The report stated that the asylum procedure of UK is failed to recognize the risk of Tamil asylum seekers upon return to Sri Lanka. From the practical information given by most of detainees, it is drawn that Sri Lanka immigration department is torturing the migrants who come from other countries. UK is a party which is against torture, inhuman, degrading treatment or severe punishment. According to Article 3 under UK immigration embassy, a person should not be deported if found that he/she would be in danger in that place. 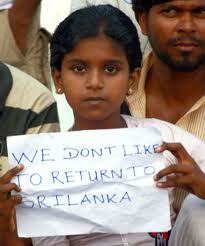 Under this policy, UK Border Agency has suspended the deportation of Tamils to Sri Lanka. At last, UKBA identified the danger of torture in Sri Lanka after considering the practical statements revealed by Human Right Watch report and temporarily stopped the deportation. Director of Human Right Watch, Mepham conveyed that it is not just UK is respecting global legal duties but a matter of minimum decency.